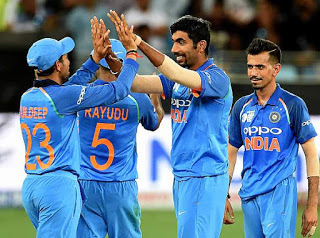 A couple of days ahead of their second run-in against India in the Asia Cup, Mickey Arthur and his boys got an up-close view of what lay ahead confronting the No.1 ODI bowler Jasprit Bumrah "We sat there for 20 minutes and I watched Jasprit Bumrah at the nets next to us, executing yorker after yorker after yorker," Arthur said. An optional net session turned educational, and yet Pakistan could do precious little about it. Bumrah turned up nearly unplayable. A thorough reading of their opponents led Arthur and Sarfraz Ahmed to believe that batting first was the way to go, even if conditions were easier in the late evening. They banked on their batsmen doing well and the bowlers striking early, rather than having to expose their middle-order in a chase.